Speak truth into everyday conversations. Be informed. Be inspired. Be involved. Yes, I would like to auto-renew my subscription when it expires! Continuous Service Guarantee: In the interest of conserving paper waste on multiple notices, and so you never miss an issue, we provide continuous service and will automatically renew your subscription at the best rate available. This also helps us be good stewards of our budget — made possible by sacrificial donations from people like you. We will always send you a reminder 60 days before your card is charged. If the credit card you provided cannot be processed a bill will be sent. 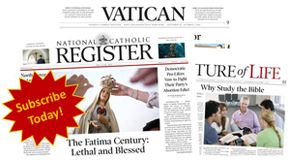 If the National Catholic Register is not for you, you may request a full refund on all unmailed issues. Stay connected with the issues of today. Who could benefit from a gift subscription to the Register? Family? Friends? Neighbors? Your parish Priest and/or Deacon? Seminarians? An email has been sent confirming your subscription. Please check your information and try again, or contact customer service at ncr@sfsdayton.com. Thank you. Foreign subscriptions: please allow 4-6 weeks for the delivery of the first issue.